Dr. Francis Collins, director of the National Institutes of Health, and chief of staff Dr. Kathy Hudson, paid a daylong visit to Emoryâ€™s Woodruff Health Sciences Center, including Yerkes National Primate Research Center, and Morehouse School of Medicine on April 14. 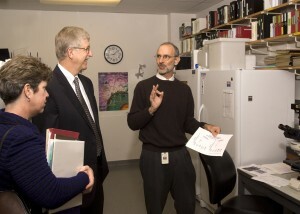 The purpose of Collinsâ€™ visit was to view the activities of the Atlanta Clinical and Translational Science Institute, one of 46 national CTSAs funded by the NIH through the National Center for Research Resources (NCRR).Â Collins also will visit CTSAs at Duke, UNC, and Vanderbilt in the future. Collins asked that his visit focus on â€œhow CTSAs are enabling science.â€ It was an opportunity for the ACTSI, a partnership among Emory, Morehouse School of Medicine, Georgia Institute of Technology and others, including Children’s Healthcare of Atlanta, Georgia Research Alliance, Georgia BIO, Kaiser Permanente, CDC, the Atlanta VA Medical Center and the Grady Health System, to showcase the unique contributions the ACTSI makes to enabling clinical and translational research. 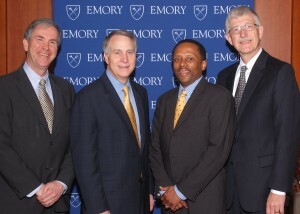 Scientific presentations at Emory included Robert Nerem (regenerative medicine) Linda Cendales (hand transplantation), Steve Warren (fragile X syndrome), Howard Hughes Investigator Kerry Ressler (PTSD in the inner city), and Carolyn Meltzer (MR/PET). Elizabeth Ofili, director of clinical research at Morehouse School of Medicine, spoke about the National Heart, Lung, and Blood Instituteâ€™s Heart Failure Network. A lunch discussion at Yerkes included Director Stuart Zola (mild cognitive impairment), Arash Grakoui (hepatitis C), Barbara Stoll (pediatrics and primates), Allan Kirk (transplant medicine), Dennis Liotta (drug discovery), and Lisa Parr (cognition, autism). Collins and Hudson also visited the laboratories of Anthony Chan (transgenics, neurodegenerative disease), Leonard Howell (addiction, imaging) and Lary Walker (Alzheimerâ€™s). The afternoon included a visit to Morehouse School of Medicine where Collins and Hudson met with President John Maupin and heard more descriptions of ACTSI support of clinical and translational research, especially in the area of community engagement. Presenters included Elizabeth Ofili (community impact) Djana Harp (onco-fertility); Lilly Cheng Immergluck (MRSA in children), Baraka Floyd (glucose monitoring); Priscilla Pemu (clinical trials); Daniel Blumenthal (community impact); Peter MacLeish (stroke, neuroscience); Byron Ford, stroke health disparities; Gary Gibbons (cardiovascular disease, genomics); Veena Rao, (breast cancer disparities); Vincent Bond (HIV.AIDS, microparticles); Jonathan Stiles (global health, malaria, HIV/AIDS); and Sandra Harris-Hoooker (NIH impact). All participants emphasized the benefits of the Atlanta CTSI in creating invaluable partnerships and new research opportunities and in serving as a catalyst for translating laboratory discoveries more quickly into clinical opportunities.